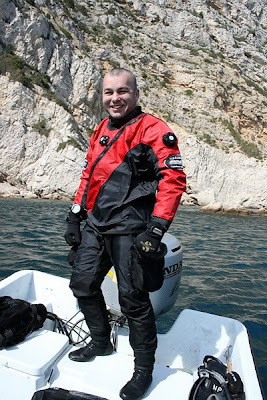 Vasco Santos from Portugal with a TLS RANGER FZ trilaminate drysuit made by GRAVITY ZERO. Vasco Santos is the owner of TOPSUB (http://www.topsub.com.pt/ ) - one of the biggest diving schools in Portugal (PADI 5 star). In Technical diving area he is DSAT Trimix instrutor, SSI Trimix Instructor and we are pleased to him as our special customer. GRAVITY ZERO supports the most demanding divers worldwide.